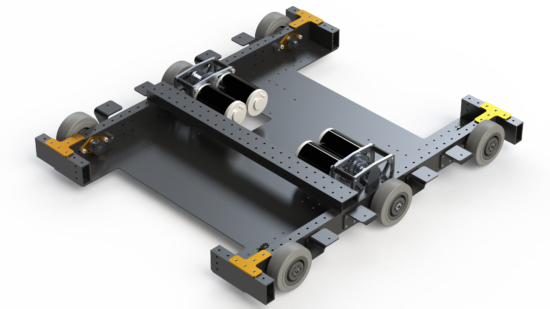 This year the drivetrain is a 6 wheel tank, driven by 4 CIMs using 2 custom one-speed gearboxes. The wheels are 4” diameter 1.5” wide Colson wheels. The robot has a theoretical free speed of 12 fps. Chain is broken to be continuous (no master links) so we needed to create a tensioning system. The outer wheels’ shafts are held in a set of bearing plates which can slide in slots in the drive tubes. To tighten the chain, a snail cam is turned with a wrench to slide the wheel assemblies out. This helps our drive be robust and easy to maintain. As our sheet metal sponsor can have significant lead times, we used our mills and waterjet to create all of the structural parts of the drive assembly in house. This allowed us to have the drive base completed early on, to begin testing and programming.